When hip new Brisbane market Boundary Street Markets sauntered its way in to town this year, it instantly cemented itself as one of the coolest Brisbane markets yet. And what's not to love? Inner-city, industrial digs; awesome stalls from Brisbane's best local artisans; live gigs in big brother music venue, The Motor Room; a bangin' Friday night party every week (otherwise known as Factory Fridays); and a heap of oh-so-delish food trucks and vans dishing up scrumptious chow. Sounds like the makings of a Brisbane markets institution to us. Which was why, when we heard that this Brisbane market gem would be partying day AND night the whole way through the weekend, we just couldn't even deal. All through summer, Boundary Street Markets will now kick on until 10pm on Saturday nights, with Saturday Night Markets! Because this Brisbane market now offers so damn much, we thought the best way to deal with the situation is to break it down day by day, in a nifty itinerary, so you can maximise the fun. You're welcome, Brisbane. The shenanigans ramp up from 4pm for Factory Fridays. Playing off the site's history as the old Peter's Ice-Cream Factory, Factory Fridays has everything a party-seeking, market lover could want. Boundary Street Market's live music venue (and function space) The Motor Room provides the tunes, and Market Lane is packed to the rafters with amazing food and pop-up shops selling clothing, homewares, and heaps more. Factory One (inside the Absoe building) is the hub of Saturday's day markets with a heap of stalls from local designers and makers selling everything from clothing, jewellery, furniture and homewares, and vintage clothes. Check out SWOP Clothing for some great vintage threads and accessories, and a cool Brooklyn flea market style vibe. There's plenty of food and coffee stalls for shopping sustenance, too. The newest night markets to hit Brisbane are just the thing to supersize your Saturday (we know where we'll be this summer). 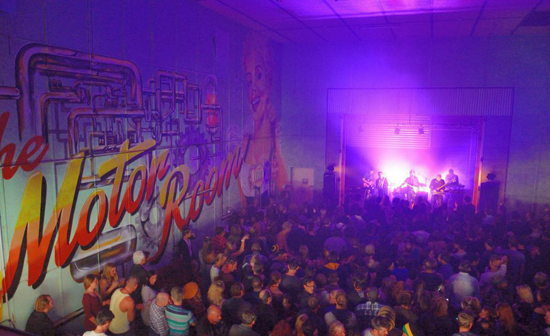 The fun rolls through to 10pm including the Market Square street eats, live music at The Motor Room (with some of Australia's best independent musicians), beers on tap, and more pop-up shops and stalls. Both Saturday and Friday nights are home to some really cool temporary and permanent attractions including a restored 1960s train carriage, BAM charity café, and a pop-up barber and beauty salon (so you can get your beard or nails did). Cool! Sundays are made for chillaxing, so round out the weekend with more shopping, or grab some coffee and breakfast from one of the scrummy food stalls. Boundary Street Markets are about to add some fresh farmer's markets to the bill too, so you can stock your pantry and fridge with some goodies from Brisbane's best producers and providores. Keep an eye out on the BSM website for the updates. Want to know more about what Boundary Street Markets has in store? Follow them on Facebook or http://www.boundarystreetmarkets.com.au/ and http://www.motorroom.com.au/ for details on who's playing when at The Motor Room, new stalls, and exciting events to throw in your calendar. TUL Note: Today's List Love post is proudly sponsored by Boundary Street Markets and endorsed by The Urban List. Our sponsored posts will never be a secret - the List Love seal will be stamped on any sponsored material you see on the site. Thank you for supporting the sponsors who make The Urban List possible.